Another example of animation on a name. You will need Paint Shop Pro, I'm using version 10. 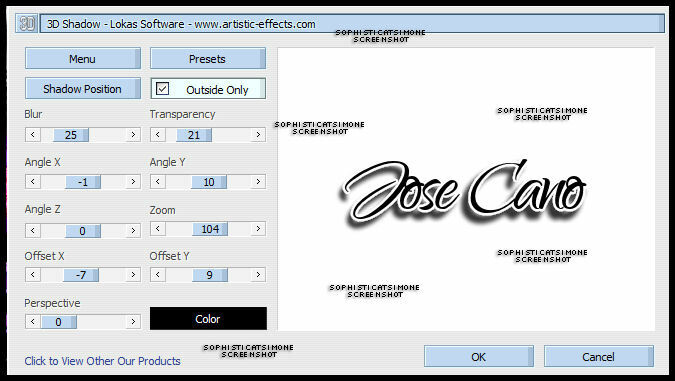 Using your text tool, click on your tag. Set your font to "Qwigley" font or font of choice. Size 100, Units: Pixel, Center Alignment. For this font I selected Kerning of -25. This does not apply to all fonts, but you can play around with it. It brings your letters either closer or further apart. Type your name out, choosing a color of choice in background materials box. 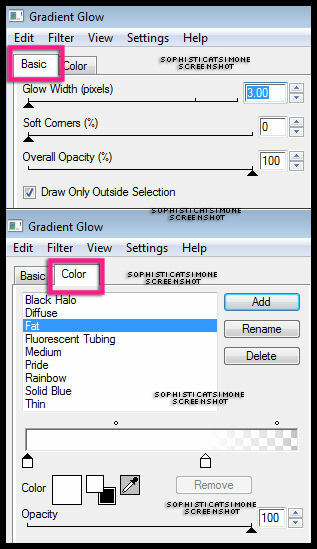 Black is NOT a good color, doesn't show the effect very well, so choose a complimentary color from your tag/tube. Convert to Raster Layer and duplicate. On bottom name (original), add Effect of choice. 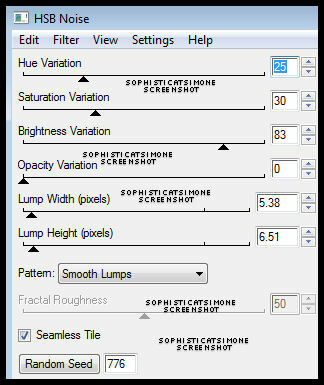 If you don't have that plug in, use your normal drop shadow in PSP. Go to Effects, 3d effects, drop shadow. Ok now click on the top name layer. 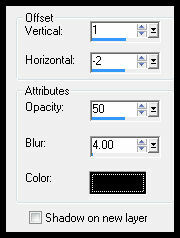 Back in PSP, go to Edit and undo drop shadow, undo HSB Noise. Now repeat the effect, and click on Random Seed. Add the same drop shadow. Go to Animation Shop and right click on the current name and paste after selected frame. Go to Animation Shop and right click on the the last frame (2nd frame) and paste after selected frame. You now have 3 frame with 3 different HSB Noise settings. Play. If you like it, go to Edit, select all. Activate your tag. Make sure all frames are selected. Go to Edit, make sure Propagate Paste is depressed (selected). Go to Edit, Paste, Paste into Selected Frame. Position and click in place where you want name to appear.